This used to be a signature dish for me back in Oz - but for some reason I never made it here. Well, it's back - with all the anchovies, bacon bits, croutons and Parmesan you could want (Peter). 1. Prepare dressing using the ShafronChef Dressing Recipe. 2. Cut excess fat off bacon and slice, fry to brown, drain and cool. 3. Remove scruffy outer leaves of lettuce and chop. Inundate in water to wash then drain, wrap in a rolled tea towel and twirl to fully dry. 4. Put on water for eggs. 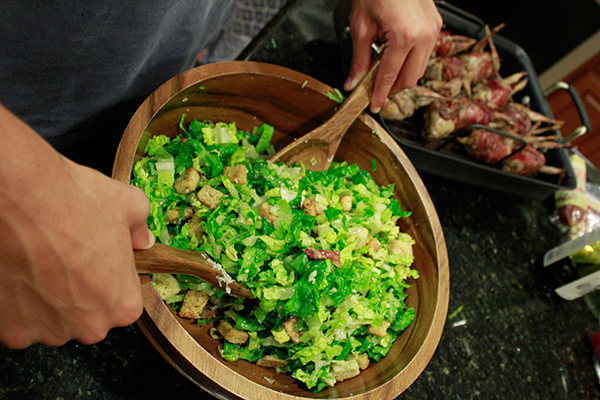 Assemble lettuce, anchovies, Parmesan cheese and bacon bits in a salad bowl. 5. Coddle the two eggs, shell, and add to dressing. Continue to cook the other eggs, then cool, shell and chop into salad. 6. Add dressing to salad. Finally, add croutons and enjoy.